So Disney's done something cute in Adventureland for the holidays this year. In an area that has traditionally been devoid of holiday decorations, the Imagineers have conjured up a whimsical overlay for the Jungle Cruise. 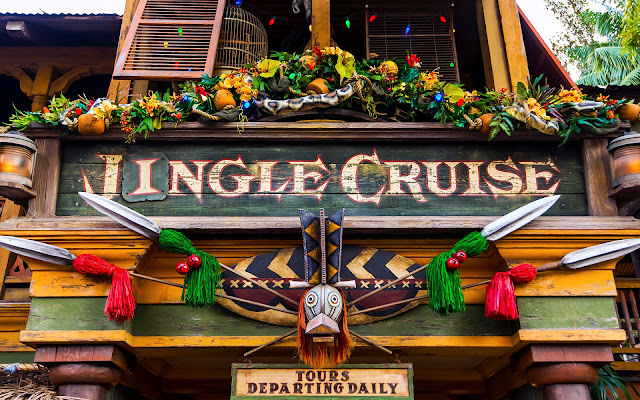 Dubbled the "Jingle Cruise," this facade focuses on the idea of the Jungle Cruise Skippers deciding to bring some Christmas spirit to their outpost. As a result, the queue has been decorated in noel garlands and colorful lights and presents to be shipped to faraway places. On the ride itself, the spiel has been augmented with Christmas-themed jokes. No decorations on the actual ride, but that's fine. This is just about having a little bit of fun anyway. Jungle bells, indeed! The Jungle Cruise has been "Christmas-fied" for the holidays.